The image above was posted earlier today by astronaut Chris Hadfield, from aboard the International Space Station (ISS). Can you see the object Hadfield refers to as being “a huge piece of debris” over toward the upper right? Hadfield posted this, along with several similar images, on his Twitter account earlier today, as an obvious nod to the fool’s holiday of April first. 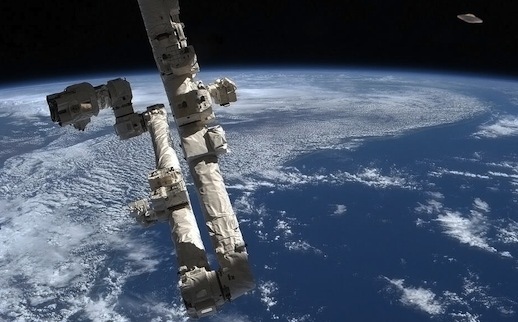 “Wow, what a huge piece of debris!” Hadfield wrote with the image, wondering aloud if, “Maybe I can grab it with the Canadarm2” (seen in the foreground of the image). A similar image was posted as well, depicting Hadfield aboard the ISS in front of the control mechanism of the Canadarm2, noting that there was “some orbital debris” visible off in the distance. Again, the phony flying saucer was clearly visible in the photo, which can be seen at Hadfield’s Twitter Account. If flying saucers ever did show up at the ISS, I’m certain by now that they would choose to do so on April Fool’s Day. Raudive Rises from the Grave: An Eerie Phone Call From the Dead?